“He got the potential to take it all the way,” says Future. As it turns out, Lil Don Loyal wasn't kidding around when he rapped I signed a deal with Freebandz, let my kids spend my advance on "Start My Day," the dabbers' anthem he dropped last week. Today the East Atlanta rapper, whose breakout single "Juice" is still gaining steam in the South, announced that he has indeed signed on to Freebandz, Future's Epic Records imprint. 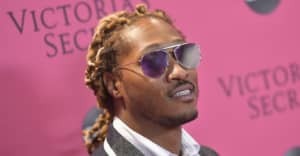 "Being signed to Future is a blessing he is a musical genius," Don Loyal told The FADER upon delivering the good news, before adding: "[Future] treats me like the big brother that wants to see the best for you." For his part, Future told The FADER that he "instantly" saw the potential in Don Loyal. "When I heard his music and I seen his videos and the way his performance was, it was, like, instantly I can see this going to the next level," he said. "He got the potential to take it all the way". To cement the deal, Lil Don Loyal has shared a new track featuring his label boss, as well as Yung Booke, called "I'm Sure Of It." It's introspective and down-beat, but hopeful—as Future warbles, I told you I would make it, I'm sure of it.